The time has come to create opportunities for Caribbean artists on the world stage, asserts a leading regional artist. Ras Aykem-i at work in New Mexico. 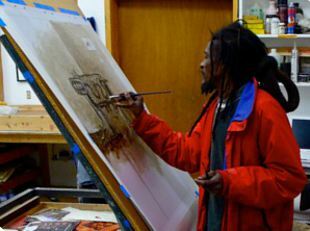 “I hope to be to Caribbean Art what Bob Marley is to Caribbean music,” asserted Ras Akyem-i, who has earned global attention for his artwork. “We are creating a collective of contemporary, forward thinking regional visual artists to overcome global perceptions that limit us to traditional images of fishing boats and palm trees,” he reported. Recently funded by local venture capital firm BIM Ventures, art-aniMAL‘s chief executive believes he finally has the support system to fulfill such a grand vision. “I have found in BIM Ventures the supportive, embracing, family-oriented model which provides a strong structure to survive in today’s competitive world,” he said. 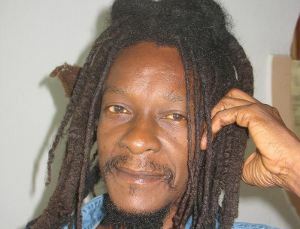 The Rastafarian pointed to support in the form of finance and shepherding (mentorship) which has given him the launch pad to grow his young and progressive art company. “There is something quite radically unique and daring about this local business organization’s decision to boldly circumvent the sterile domestic business traditions, and confidently invest timely funding in a visual artist or poet,” he mused. The campaign to give Caribbean art global prominence took off in November with a presentation at the Liverpool Biennial, one of the most exciting contemporary visual arts events in the United Kingdom. Later, art-aniMAL received positive reviews in Santa Fe, New Mexico, where Ras Akyem-i collaborated with master printmaker Michael Costello of Hand Graphics Studio to produce a unique body of limited edition lithographs. “We are pleased with the success of our Santa Fe trip and the work that was produced there. We have sold seven out of 10 exclusive pre-released prints and have generated a number of leads,” said art-aniMAL managing director Adam Werth. Ras Akyem-i, whose work has recently been on exhibition in Martinique, now looks forward to this weekend’s Caribbean Fine Art Fair in Barbados.